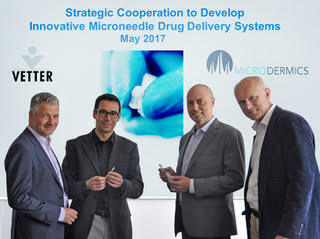 Ravensburg, Germany, and Vancouver, Canada--Month Day, 2017 – Vetter, a leading and innovative provider of aseptic prefilled drug delivery systems and Microdermics Inc., a Vancouver-based medical device company developing a novel hollow, metal microneedle drug and vaccine delivery system, today announced that they have entered into a strategic cooperation agreement. The market in novel alternatives to needle injections is forecasted to grow rapidly, reaching in excess of 480 million units by 2030 (Roots Analysis report). Microneedles are a novel technology that can offer promising advantages as an alternative to classical needle injections and other routes of administration, mainly in reducing the injectable dose needed to trigger an immune response and accelerating drug absorption by the body. The roadblocks to commercialization are mainly due to limited investment in scalable aseptic manufacture at the later phases of development. To overcome this hurdle the two companies have joined forces to lever the expertise of both firms and enable late stage process development and device manufacture on a commercial scale. The Microdermics microneedle technology is commercially scalable and capable of pain-free injections into the pharmacokinetically beneficial intradermal space, providing improved comfort and treatment to patients. Microdermics has successfully demonstrated initial safety of its microneedle system, and is planning Phase 1 human clinical trials for vaccine and therapeutic delivery to be initiated in 2017. As a leading contract development and manufacturing organization (CDMO), Vetter offers a beneficial service to its customers through a combination of device development and associated drug product manufacturing and packaging services. Vetter tries to integrate its customers in technological advancements as early as possible. By continuously participating in market development in innovative and proactive ways, the company is committed to acting with the goal of increasing patient convenience and compliance in mind. addressing the global reliance on the 160-year old hypodermic needle and the economic and health implications associated with widespread needle phobia. The company’s Phase 1 clinical trials to validate the effectiveness and reliability of intradermal delivery are expected to initiate in 2017. Microdermics will focus product development and clinical activities on new delivery methods for existing commercial products, providing innovative methods for partners to differentiate via a novel intradermal delivery system, as well as pursue product life cycle extensions. “Microdermics is extremely excited to work with a world-class partner like Vetter, since our strategic interests align and their decades of experience and innovation in the fill and finish segment will enable us to accelerate our commercialization strategy. Vetter’s vast experience with a wide variety of drug substances provides us with an invaluable opportunity for a successful development path for our microneedle drug delivery technology,” said Grant Campany, President & CEO of Microdermics. “While our individual companies differ in size, experience and structure, we are fully aligned in our vision to achieve the best possible patient convenience with our product offerings,” said Prof. Boris Stoeber, Microdermics’ Co-founder and Chief Technology Officer. For more information, please see our FAQ or contact us at here.